I'm taking a few weeks off working to spend some time with my lovely lady before she flies back to South Africa for a few months. We're in Pembrokeshire for a few weeks and plan to make the most of the fantastic scenery here. First on the list is the Witches Cauldron, somewhere very special indeed. 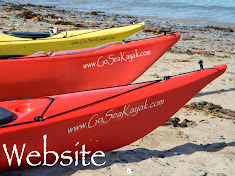 The images here are from two paddles that we did, a couple of days apart and at different tide levels. We are camped at Ceibwr Bay and the short walk to the sea is most welcome. The cliffs are instantly wow upon leaving the bay! Cave present themselves very quickly. This is a hundred metre'ish tunnel but the swell at the far end prevented us going through today. We pop through rock gaps instead. This little critter is a Guillemot in winter plumage. He actually floated along side my kayak and pecked my hand! Pretty special experience! After a quick scoot through the swells we found ourselves inside the Cauldron. But due to the high tide there was only one anti chamber available. We plan to return! We head out for more caves. These are the very impressive arches at Ceibwr at the end of our first paddle. Two days later and still at camp at Ceibwr we head back out on a lower tide. The big tunnel looks better but the tide is now too low at the far end. So we head back into the Cauldron. We're not alone as a lady Seal came to check us out. On both these paddles the Seals were a regular sight. Now at low water other antechambers were open to access. Apparently theres more than one use for a shewee? And we enjoy exploring on foot too. I wonder where I'll choose to paddle next?? ?